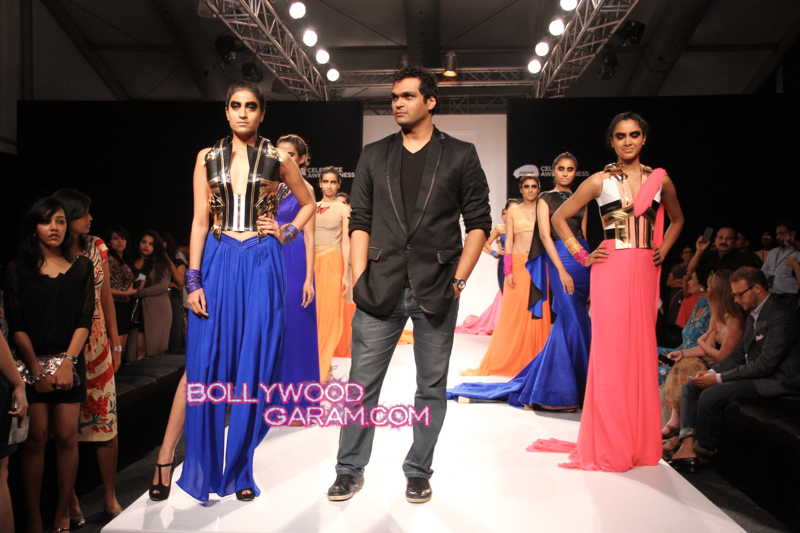 BollywoodGaram.com: Day 3 of the Lakme Fashion Week 2013 had designer Swapnil Shinde showing off his resort collection. Shinde’s collection was a re-imagination of Lewis Carroll’s Alice as a funky and futuristic girl throughout the show. The event started off with a mind-bending audio and visual which was based on Alice’s Adventures in Wonderland. The interpretation of the designer was a psychedelic one with acid colors appearing on monochrome outfits everywhere. The collection included slinky metallic petals, psychedelic tessellations, geometric motifs and even a deck of cards. All these elements came together for his collection which was called as Alice on Acid and can be perceived as a wonderland of whimsical fashion.